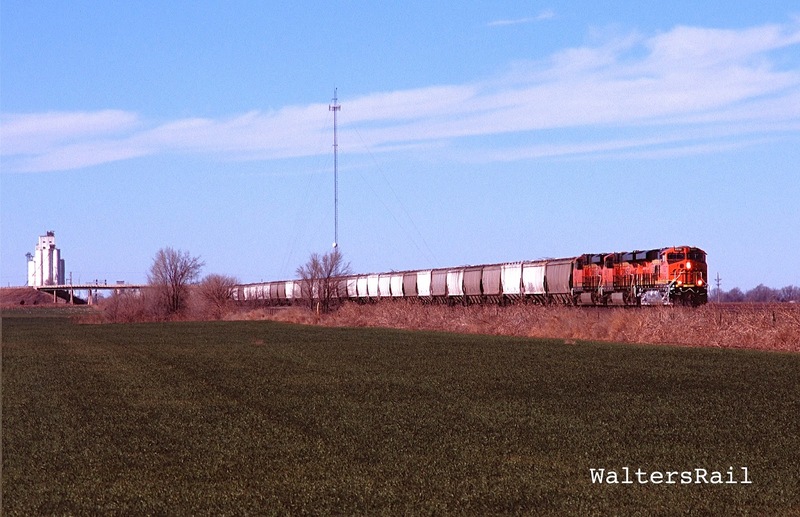 Wellington, Kansas, sits near the northern edge of the dry land, winter wheat belt that runs from central Kansas through western Oklahoma and west Texas. Here farmers grow hard, red winter wheat originally imported from Ukraine -- without irrigation. Every growing season is a "crap shoot," because the crop is planted in the fall. If there is not enough rain in October, much of the wheat will not grow at all. With proper moisture, the wheat will appear out of the ground -- small green shoots that sit all winter, a sea of green in an otherwise brown landscape. Winter wheat starts growing again in the spring if there is enough rain. If there is too much rain, especially near harvest, the crop will rot. So being a wheat farmer is a real gamble, year after year, which is why everyone in these parts has crop insurance -- the original "hedge," or "derivative" as Wall Street likes to say, that one day in the early 21st century led to "credit default swaps" which then led to the Great Recession of 2008, from which the country has not yet recovered as of the date of this post (October 2016). But this post is not about finance. 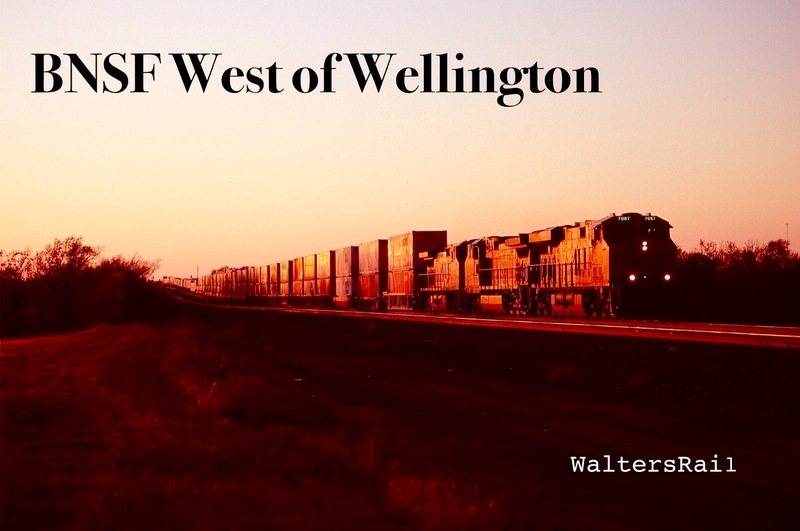 Rather, I will discuss the great railfan locations west of Wellington. 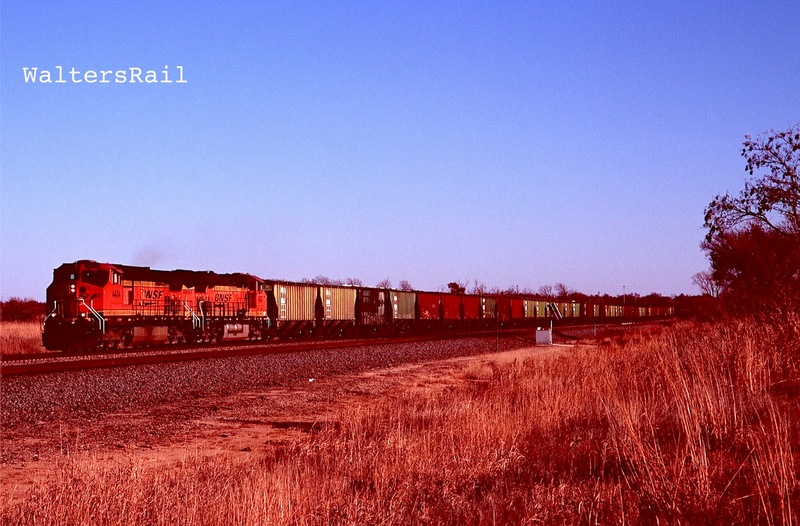 The images herein were taken from November 2015 through February 2016, the perfect time to photograph this country, when the sun is low in the southern sky and one may take images of trains running either eastbound or westbound. 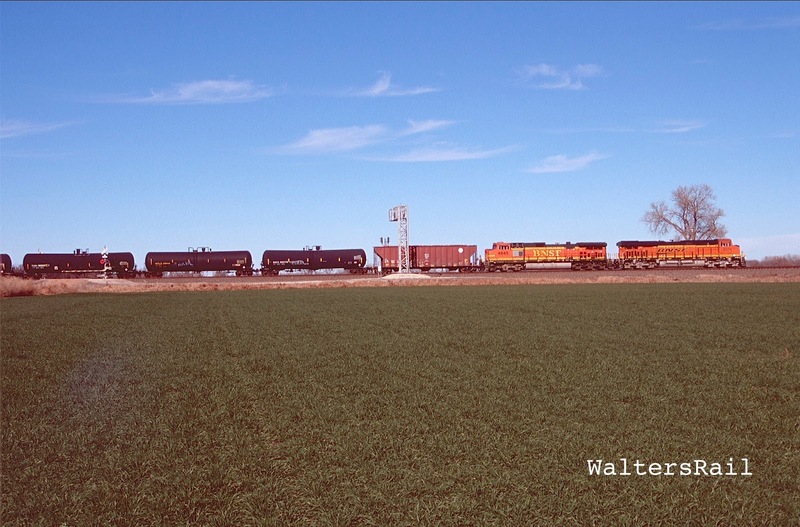 Also, as mentioned, many fields are carpeted with dark green wheat and are so unobstructed that one can photograph the full length of a train. Wellington was, and always has been, a railroad town. 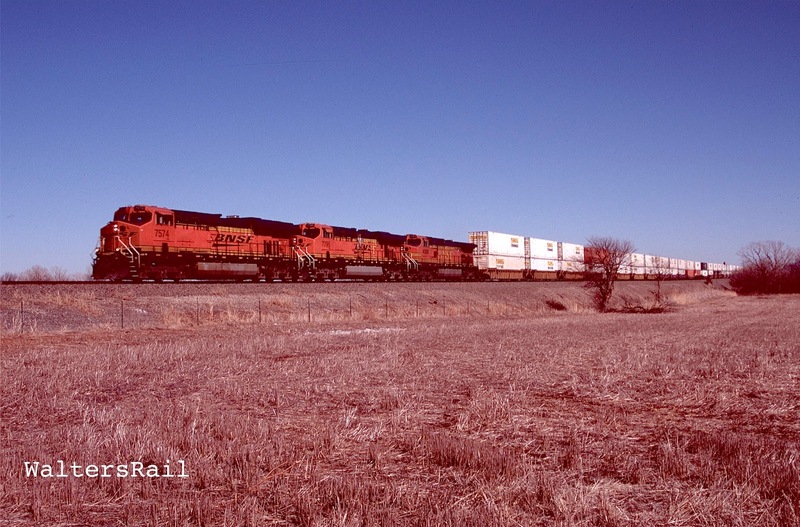 Today it is a crew-change point on the BNSF Transcon, and high priority freights spend little time waiting for fresh crews. The Oak Tree Inn in town is large, indicating the number of railroaders who lay over. 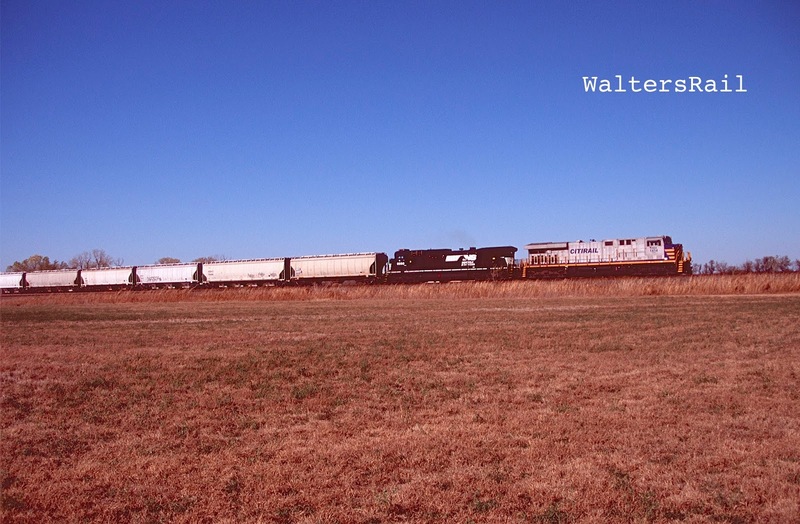 In the 19th century, Wellington was the railhead for cattle drives from Texas across Oklahoma Territory. 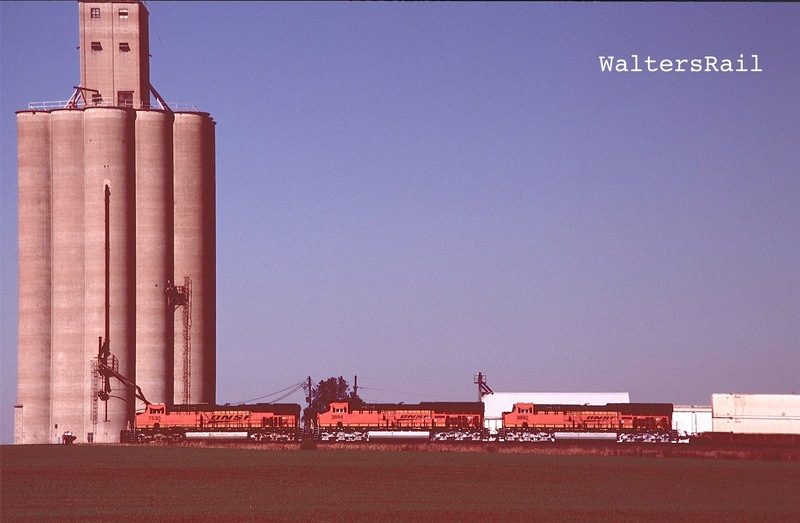 As rails were extended south, the cattle drives ended, but Wellington also retains the flavor of a "cow town," as does Caldwell, Kansas, sitting almost directly on the Oklahoma border. 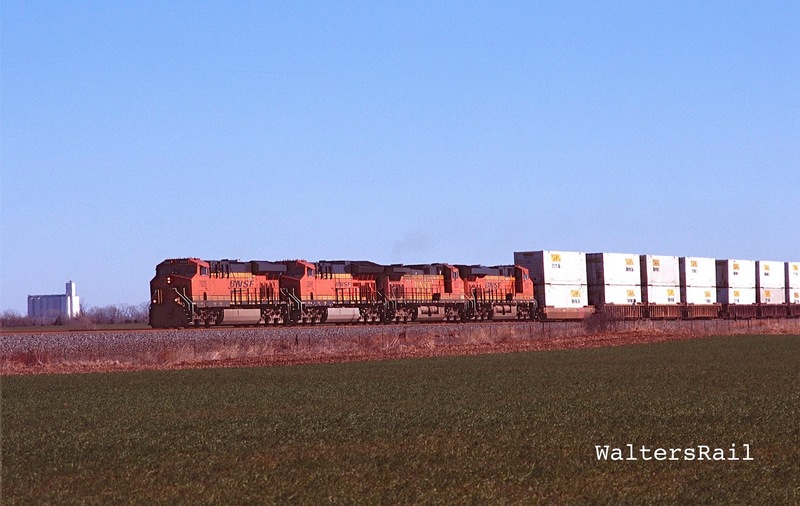 Two railroad lines intersect in Wellington -- the Transcon from Chicago to California, and the Union Pacific north-south main from Harrington, Kansas, to Fort Worth, Texas. 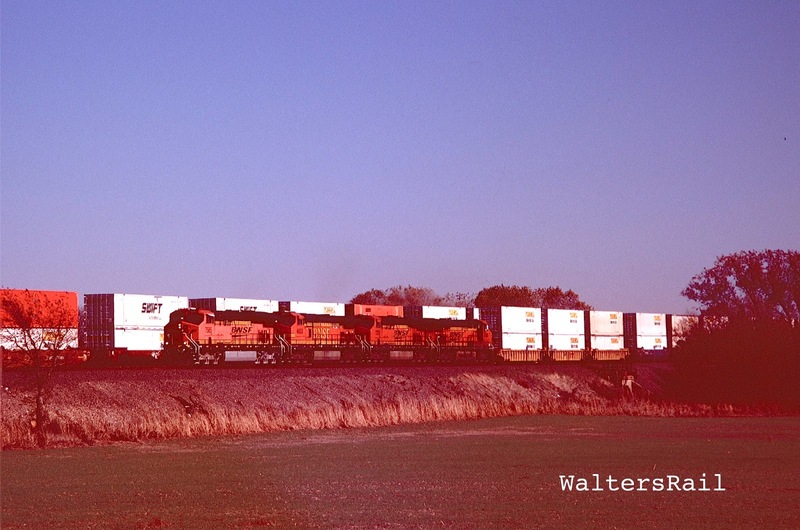 The UP line was formerly operated by the Chicago, Rock Island and Pacific, and many long-time residents of Wellington still call the railroad the "Rock Island." The two roads pass each other at a grade separation, with the Transcon above and UP below. 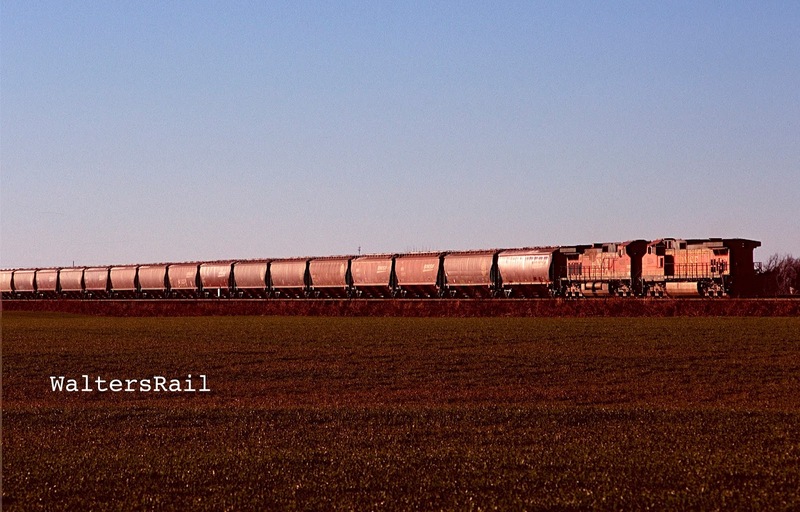 The UP line is "dark," dispatched by radio and track warrants and sees about 8-12 trains per day. Most of the traffic is wheat, oil and other commodities. 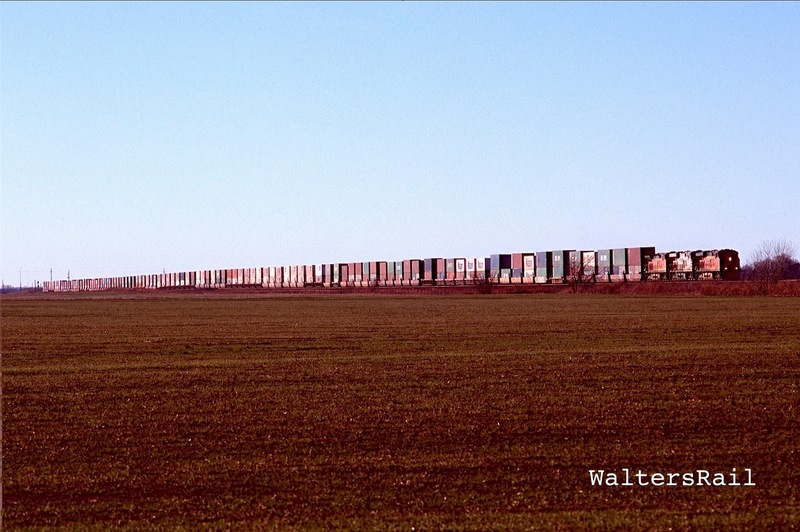 The Transcon, on the other hand, is almost exclusively intermodal -- trailers and stacks. Traffic on the line is almost always heavy. 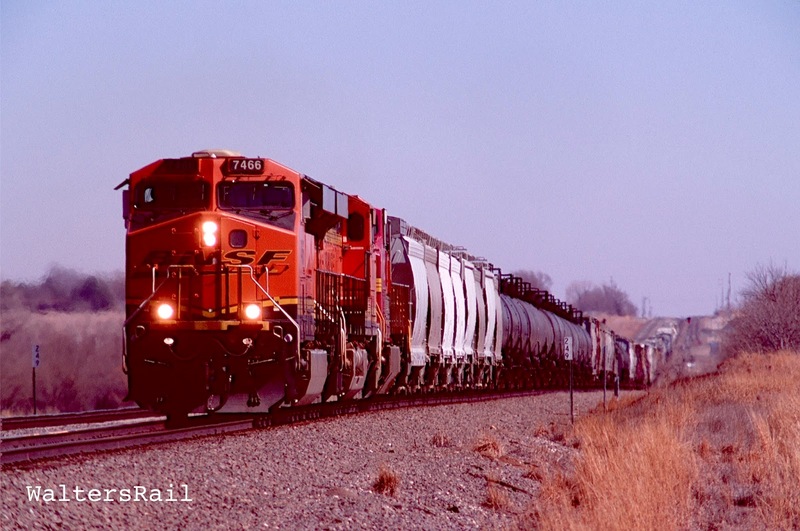 Some days I have seen an average of four trains per hour! Wellington is far enough south that good winter days can be pleasant, with clear skies, light winds and temperatures in the 50's. That time of year, the air has little humidity; there is no haze. Images taken under such conditions have an almost crystalline quality, as though looking at a landscape through cut glass. Although Wellington lies only about 130 miles north of my home in Edmond, Oklahoma, the difference in winter temperatures can be marked -- ten to fifteen degrees. There have been days when I left Edmond in January, wearing only a light sweater. Upon exiting my Jeep in Wellington, I put on a coat, stocking cap and gloves. As the images in this post demonstrate, rights-of-way along the Transcon west of Wellington are generally kept clear of brush and tall grass. 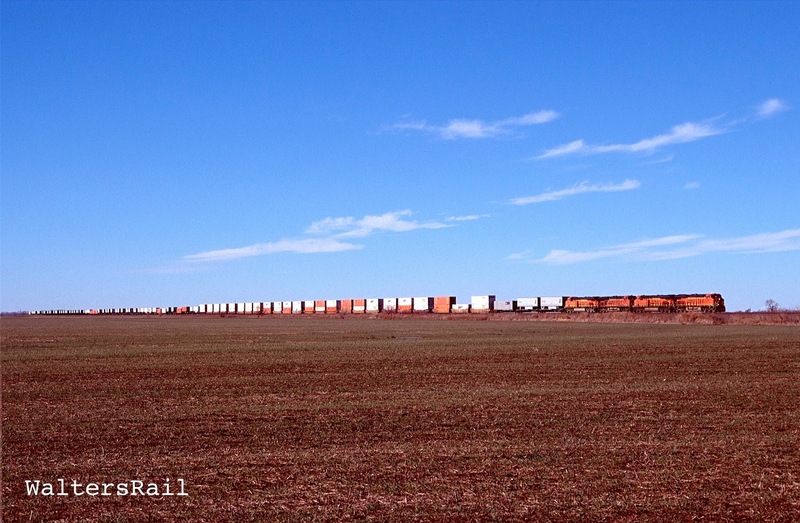 There is thus nothing to block the view of the tracks for miles in both directions. There are well maintained section roads, but the black soil can be sticky when wet, so I recommend a four-wheel drive vehicle in the rain. 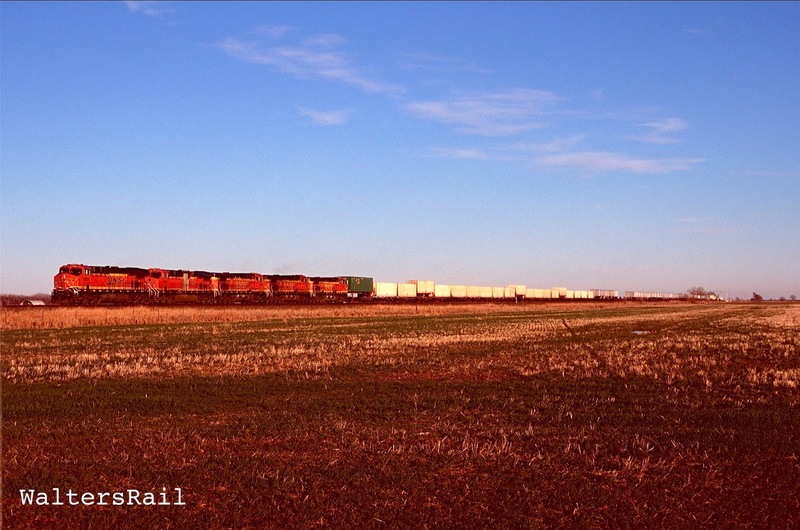 The tracks run due west out of Wellington with no towns of any size for many miles. The first village west of Wellington, Mayfield, is just big enough to have a post office. In the 2010 census, Mayfield's population was 113. I think that estimate was generous. West of Mayfield approximately seven miles lies Milan, with a 2010 population of 82 and no post office. I think that estimate was even more generous. These little towns sprang up along the railroad in the 19th century and were purely speculative. There was no reason for towns to be located in these areas -- other than someone's hope that if a town were started, it might reach critical mass, begin to grow and generate profits for the founder(s). Almost all such places never grew big enough to be sustainable. When you look at them today, you think that there must have been some substance to the place years ago, but that the lifeblood has drained away over the years like a dried-up water well. The truth is, these towns were never anything to begin with. The area around Wellington is generally referred to by geographers as the "Southeast Plains," which include the Osage Plains and the Flint Hills. The Osage Plains cover west-central Missouri and the southeastern quarter of Kansas, most of central Oklahoma and north-central Texas. Three subregions comprise the Osage Plains. The Osage Plains proper occupy the northeast segment, a transitional area where the boundary between prairie and forest has shifted over the ages. 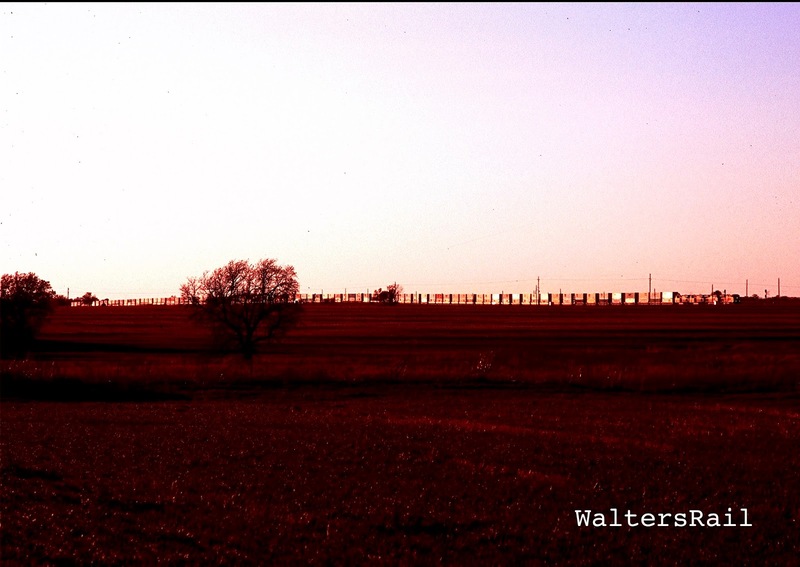 To the west and south lie the Blackland Prairies and the Crosstimbers. My hometown of Edmond, Oklahoma, is located in the Crosstimbers, a forest of oak and other hardwoods, intermixed with Eastern Red Cedars and underlain by sandstone that resulted from dunes formed during the last ice age when rivers overflowed with sand caused by melting glaciers to the north and west. The soil in the Crosstimbers is bright red. My grandfather used to say that you can't plant corn with a shotgun in the Crosstimbers. Wellington lies in the Blackland Prairies, where the soil is fertile and almost perfect for growing wheat. Many people seeing the Blackland Prairies for the first time mistakenly believe that the land is treeless. On the contrary, in its natural state, this land would be a mix of woodlands and grasslands, the locations and percentages changing from century to century with the weather, like clouds moving across a blue sky. Wet periods would produce more trees; dry seasons more grass. However, the land in its current form is not natural. Centuries ago, Native Americans (who migrated from Asia over the land-bridge to Alaska) began burning the prairies in North America every fall to encourage new grass growth each spring and also to clear timber from land where bison grazed. No one knows for sure how long the burning continued. I have seen estimates from several hundred to several thousand years. In any event, the land you see today around Wellington is the result of such burning. When Europeans moved in, and drove out the Native Americans, during the 19th century, the ground was already cleared. Constant plowing for the past two hundred years has kept the ground free from timber. But should a plague suddenly wipe humans off the earth, the woodlands would quickly re-establish themselves. I say this from personal experience. I have allowed part of the property I own in central Oklahoma to "return to nature." In the past nine years, what was once a pasture has begun to fill with trees. I estimate that in another fifty years, long after I'm dead, the area will look like the forest it was before the arrival of Europeans. If you wonder why Native Americans did not burn the ground where I live -- the forest in the Crosstimbers is too thick for annual burnings. The forest will only succumb to massive cuttings. Then the downed trees must be burned. Then the stumps must be removed one-by-one. Only then will the red soil and sandstone appear. Since the ground is too rocky for farming, very few people (either Native American or European) have ever bothered to clear the trees, except for the occasional rancher. 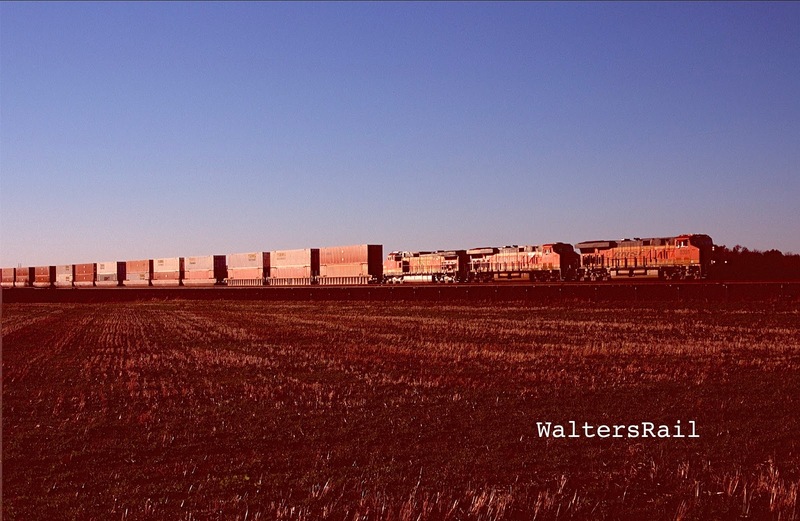 In 1880, the Southern Kansas and Western Railway began construction west from Wellington. In those years, railroad construction was totally speculative -- in much the same manner as the Internet has developed in our time. 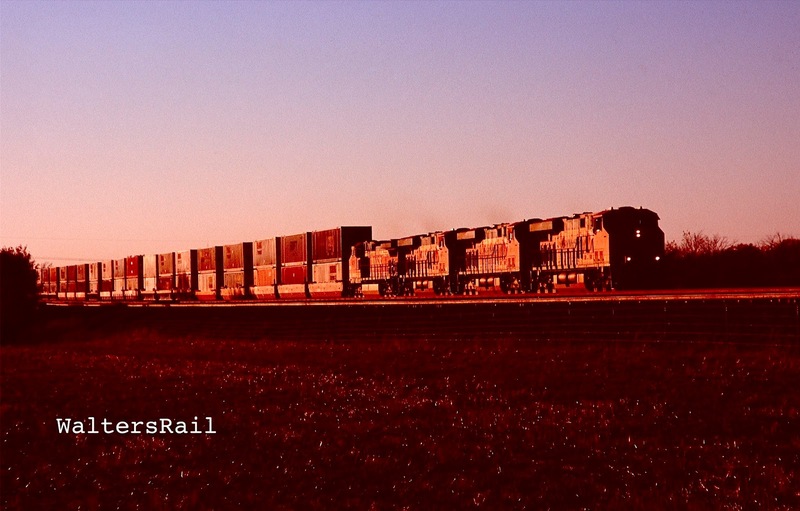 Everybody wanted to build a railroad in hopes that it would eventually form part of a transcontinental line and bring untold riches to the towns through which it passed. 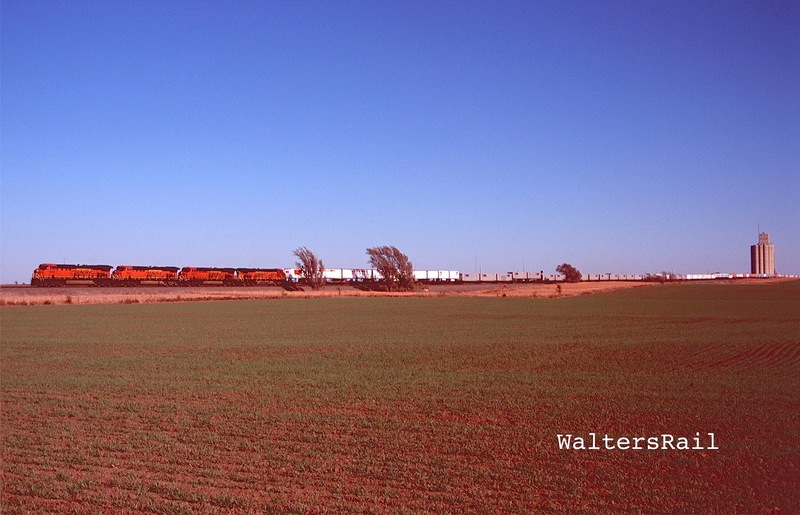 The Southern Kansas and Western was eventually purchased by the Atchison, Topeka and Santa Fe and became part of what we know today as the BNSF Transcon. 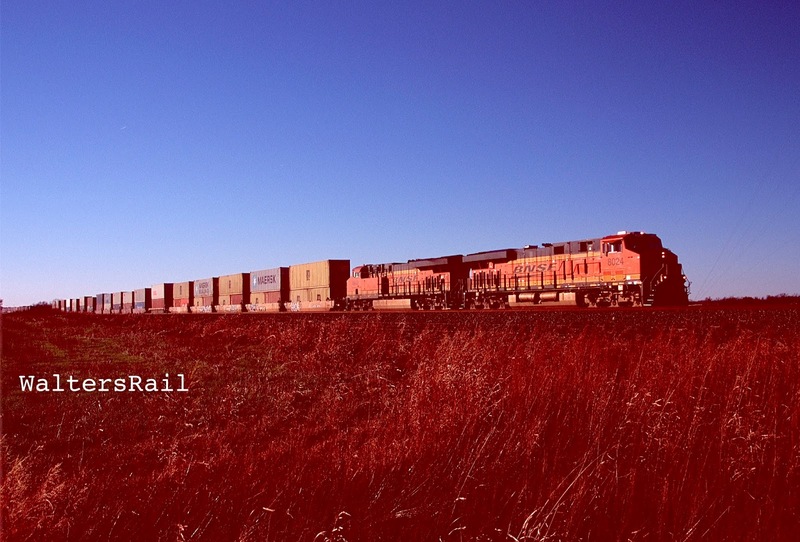 The line was extended to Attica, Kansas, in 1884, and to Kiowa (near the Oklahoma Territory border) in 1886. 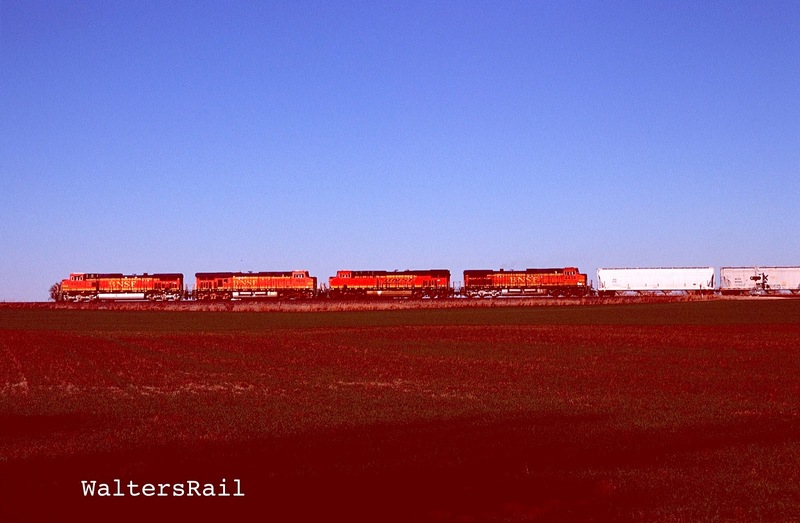 This line ran west from Wellington to Mayfield and thru Milan before entering Harper County. In 1908, the track was moved to the north 300 feet to avoid areas of frequent flooding. I am astounded by the audacity of 19th century railroad builders. Speculators were willing to build a line in the hope that someday it would make them rich. Then they relocated the speculative line to avoid floods. Then they waited to be bought out. Doesn't that sound like what goes on today (2016) with internet companies? Recent trips to Wellington have included my dog Bear, aka Mighty Dog, who loves to explore wheat fields in winter, looking for mice and other prey. To my knowledge, Bear has never caught anything. If he did catch something, I do not think he would know what to do with it. But he keeps trying. 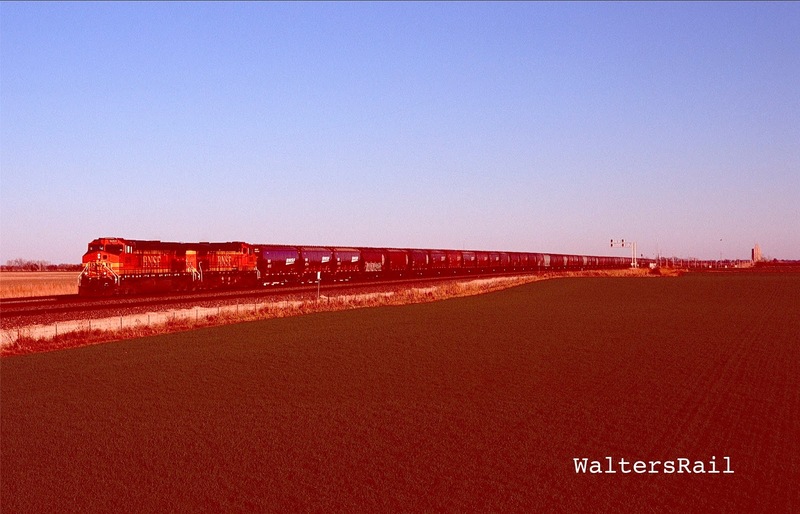 On a recent trip, I photographed a westbound grain train, then whistled for Bear to come to the Jeep. He is so short, with three inch legs, that I often cannot see him. But I can hear the jingle of his collar. This time I heard nothing. "Bear!" I shouted, then whistled again. I have an inordinate fear of losing the dog, because my wife is in love with him. Were I to come home some evening and announce that Mighty Dog had been left behind somewhere in rural Kansas, the result would make headlines, as in: "Wife Kills Husband with Single Glance." So I began walking down the dark, dusty road, looking for my dog, wondering why I put up with him. I'm certain he has the same feeling about me. Then I heard the jingle of his collar. Then silence. Then another jingle. I followed the sound and found him behind a large Eastern Red Cedar, pawing quizically at a dead squirrel lying motionless on its side. I have no idea how the squirrel died, but there he was. Bear seemed not to believe that the squirrel was dead. He nudged it in the belly with his nose. Then he pawed at one of the squirrel's limp feet, which looked like miniature hands, so long were the toes. I realized then that much of a squirrel's climbing prowess comes from its ability to hold onto things. For example, this morning I watched a squirrel jump from the roof of my house onto the closed umbrella of my patio table. With its front and back feet, the squirrel grabbed the canvas, then shimmied down to the table top, then jumped to the ground. Who knew that squirrels climbed that way? 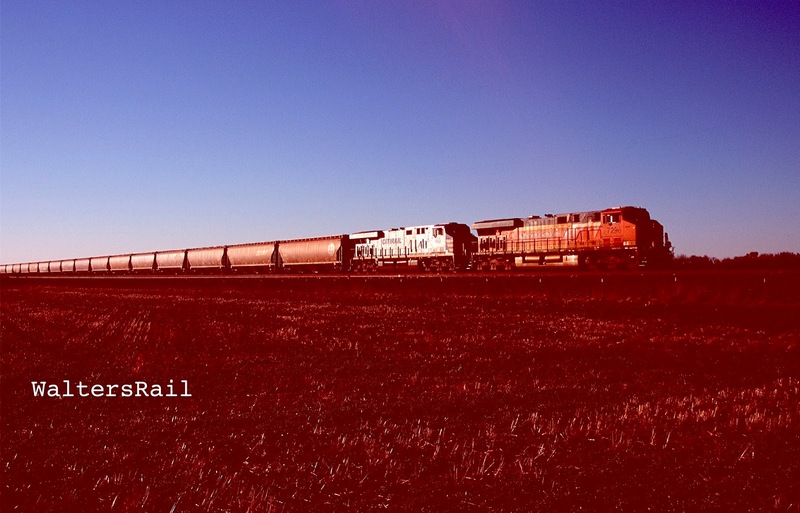 Suddenly, I heard the whistle of a westbound. I raced back to my tri-pod and took the image immediately above, while Bear waited beside the dead squirrel. I'm uncertain what the point of the story is. It could be that our lives are as ephemeral as a squirrel's. It could be that some dogs, like Bear, are kind and gentle. It could be that little things are interesting when you are waiting for a train. Wellington averages about 14 inches of snow per year, about three times as much as my hometown of Edmond. This coming winter, I hope to spend a day along the tracks after a new snowfall. If the snow is not too heavy, shoots of winter wheat will sprinkle the white snow like gum drops. I will take Mighty Dog with me, but he does not like the cold. He will stay in the Jeep and wrap himself in a blanket. Occasionally, he will climb up on his hind legs, look out the window and wonder what exactly am I doing. Then he will go back to sleep. I feel very comfortable in Wellington, Kansas. The people are friendly and unassuming -- pretty much like Okies. I always laugh when I hear people talk about "flyover" country. If they only knew. 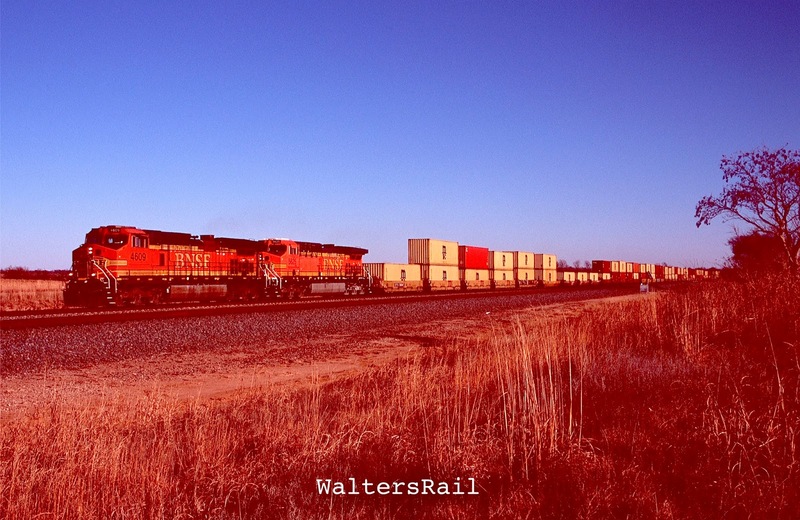 See all my posts at waltersrail.com.